We are a friendly yet upscale salon conveniently located in Columbia's historic downtown VISTA ..
Our salon proudly, yet humbly houses some of Columbia's premier stylists! 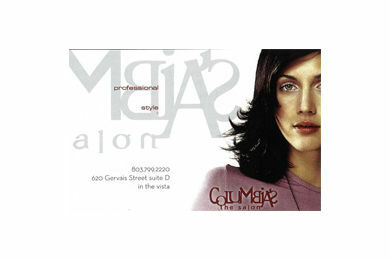 Since opening our doors in 2001 we have quietly earned a reputation as one of Columbia's most respected and in demand color salons. All our stylists are highly trained and have a great passion for the art of beauty .We continue to educate ourselves on a regular basis to be able to offer our clients every aspect of the classics as well as the newest in hair and nail trends.